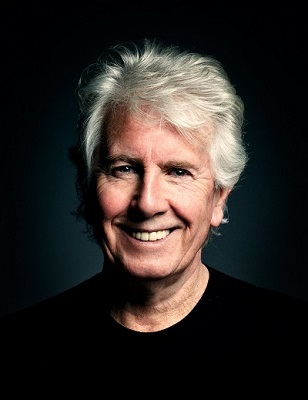 Towering above virtually everything that Graham Nash has accomplished in his first seventy-five years on this planet, stands the litany of songs that he has written and introduced to the soundtrack of the past half-century. His remarkable body of work, beginning with his contributions to the Hollies opus from 1964 to ’68, including "Stop Stop Stop," "Pay You Back With Interest," "On A Carousel," "Carrie Anne," "King Midas In Reverse," and "Jennifer Eccles," continues all the way to This Path Tonight (2016), his most recent solo album. The original classic union of Crosby, Stills & Nash (& Young) lasted but twenty months. Yet their songs are lightning rods embedded in our DNA, starting with Nash’s "Marrakesh Express," "Pre-Road Downs" (written for then-girlfriend Joni Mitchell), and "Lady Of the Island," from the first Crosby, Stills & Nash LP (1969). On CSNY’s Déjà Vu (1970), Nash’s "Teach Your Children" and "Our House" beseeched us to hold love tightly, to fend off the madness that was on its way.